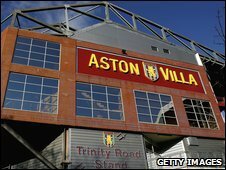 Birmingham's Villa Park has been withdrawn as a venue to host 2012 Olympic football games because of uncertainty over rebuilding plans. Aston Villa's ground was to have been one of six around the UK and organisers are looking for a replacement. "The club is considering plans for major construction work over the next few years," read a statement. "Whilst these plans are developed, the club is unable to commit fully to hosting matches." The statement, by the London organising committee, continued: "Locog is grateful to Aston Villa for its support to date, and is continuing with its planning in order to deliver a first class Olympic football tournament." Aston Villa had been hoping to add 8,000 seats to the ground's current 42,640 capacity in time for the Olympics. Where would you like to see Olympic football played? Hampden Park in Glasgow, Cardiff's Millennium Stadium, Manchester United's stadium Old Trafford, and St James's Park in Newcastle will all host games in the preliminary round of the men's and women's tournaments. And the finals will take place at the new Wembley Stadium.